← Admonition – It’s Valentine’s Day, So Love Strongly! The unavoidable reality of what happened to those Coptic Christians on that beach last Sunday keeps running around my head in a loop these days. Many are asking, including me, what would it take to generate a response in this nation that reaches beyond more bloviating speeches and word games in Washington? Almost as disturbing as the rising tide of atrocities being perpetrated against innocent men, women, and children in country after country is the lack of a corresponding rising tide of national outrage from our own. But it isn’t the response of bureaucrats, politicians, and the media that most concerns me. There’s a question much closer to home. How should those of us who are also called ‘Christians’ respond? What is our admonition from God for a time like this? The suggestion to pray is certainly an obvious and appropriate one, but that response, as vital as it is, all too often gets reduced to cliché status for Christian America. Far too frequently, prayer amounts to little more than a few familiar words uttered in the course of a well-worn path through another obligatory religious ritual, another exposition of lifeless, antiseptic orthodoxy. Is another trip around that track the best we have to offer? In a time that begs us to reach into the depths of our soul for a response as profoundly real as the blood that stained that beach, we seem to come up empty. It grieves me to think that more real passion was felt and exhibited by American Christians in response to the last Super Bowl than anything connected to the horror of last Sunday’s massacre. Christian America has probably shed more tears over Hallmark movies and Facebook posts for the past week than thoughts of what it must have felt like for those men as their heads were being cut off, or for what their wives, or children, or brothers, or sisters, or friends had to witness. And that is deeply disturbing. Some simply change the channel and stop listening. Do we join them and just bail out as well? If not, what options are left? If we decide that muttering a few words in prayer as we flip to a different station is not the best we have to give, then what do we offer in its place? Two things are clear. First, it is a time to hear from God, not just political commentators. That’s the easy part. Obedience to what He admonishes us to do is where it gets hard. Predictably, He points us toward love—by His definition, not ours, and then toward one of its salient characteristics, compassion. “Finally, all of you be of one mind, having compassion for one another; love as brothers, be tenderhearted, be courteous” (1 Peter 3:8 NKJV). God knows nothing of love that does not express itself in compassion. Compassion is that unique capacity He built into us that allows us to embrace and absorb another’s condition or circumstance into our heart as though it were ours. What we’ve come to call ‘the Golden Rule’ is predicated upon compassion, thus it involves much more than just a sad thought. It is a deep and conscious embracing of another’s plight as our own. It is an indelible characteristic of the love God offers us. To refuse it is dishonoring to Him and destructive to the foundations of relational harmony and social stability. Obviously, we owe compassion to the innocent victims of last Sunday’s horror spectacle. But does it stop there? Is the compassion we’re called to offer reserved for only our own spiritual ‘family’? What about the ISIS killers? They certainly showed no compassion, so why should they get any? This is where it gets hard. Suppose someone had seen their plight before they became killers? What if our mission to take the Good News of the kind of love that offers forgiveness, and redemption, and peace had found them before the lies, before the hate, before the violence took root? Compassion must be poured out for our brothers, no doubt, but it must be extended to those who aren’t brothers yet, but could be. The ‘good Samaritan’ in Jesus’ story stands apart from those who ignored the wounded man in one singular regard. 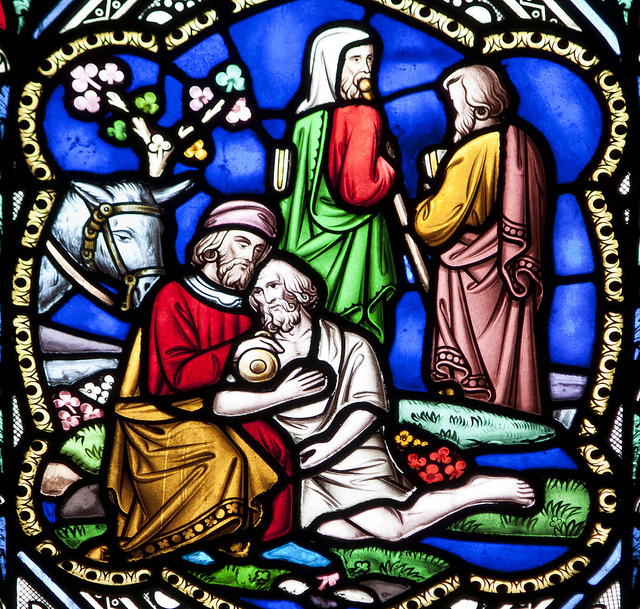 The Samaritan extended compassion. He saw more than a man in need. He saw himself in that same place, with those same wounds. Compassion does that. Jesus fed thousands of hungry followers, because He had compassion. Hopeless lepers were cleansed, because He had compassion. In an astounding act of mercy and paradoxical irony, He reached beyond His own agony and extended compassion to those driving the nails through His flesh. Before we found redemption and life at Calvary, we were made recipients of His compassion in Gethsemane. He had a choice, and compassion didn’t let Him ‘change the channel’ on us. Compassionate love wouldn’t let Him ignore us, and as He lives in us, it won’t let us ignore the cries of others in distress either. Our compassionate expressions of shock, or grief, or outrage, and our impassioned pleas for justice will not have any immediate impact on the world scene. But that isn’t the objective. God doesn’t expect them to change things half-way around the world. He expects them to change things here. Compassion doesn’t just recognize and respond to the plight of others. It reveals who we are, and what kind of God we serve. ISIS killers expose their own barren soul, and the hateful and vindictive deity they follow by how they treat those who believe differently. So will we. We pour out heartfelt grief on behalf of our Coptic brethren because God has made us family. Because of that, we commit ourselves to the struggle, because it is ours, as well. We mingle our tears with those of their wives and children because their loss is our loss, too. Armed aggression and brutality cannot be ignored. Sometimes armies have to fight, and this is clearly one of those times, but the conflict goes much deeper, because the core issue has always been a spiritual one. Lost people, Muslim and otherwise, need Jesus. We can do a lot of things with a bullet, but removing darkness isn’t one of them. This entry was posted in Admonitions for This Hour, Faith, Family, and Culture, In the News, Insights, Series Topics, Wake Up Calls and tagged Coptic Christians. Bookmark the permalink.